For those that either know me or have read the ‘About Me’ tab, you’ll know that I go to Hawaii every year with my family. I’ve been incredibly blessed and fortunate to have started traveling there when I was in middle school and as such, will be going again this summer. We have visited several islands over the years: Oahu, Kauai, Maui, and the big island of Hawaii. So, quite often, family, friends, friends of friends, etc., will ask me for recommendations on what to see and do. This occurred last week when a former co-worker reached out to me because she’ll be visiting Maui and Oahu in a few months with her family. Since the list is fresh and the question is often asked, I decided to share more broadly. Here you go! Maui: It’s been quite a few years since I’ve been to Maui, but it is my most favorite island. There is just the right mix of things to do and relaxation. The last time we were there we took ‘The Road to Hana’. To say it was bumpy would be an understatement–my father stopped speaking to me after the tour. Personally, I thought it was super fun and very pretty. I suggest a tour so you don’t have to worry about damaging a rental and if you do get a rental, tell them where you’re planning to go so you can get an appropriate vehicle because the terrain really is that bad. Hawaii: If you like doing things outside, this is your island! There’s hiking. There’s horseback riding. And there’s the Volcano House, you simply must go. It sits at the top of Kilauea, which yes, is still erupting. You can see actual craters, historic lava flows, and steam coming from the vents in the ground. A few years back we took a tour (my father is big on tours) that went to see live lava flow at night. We, the tourists, stood several yards away and watched the lava flow into the ocean, the Hawaiian bus driver/tour guide stayed with the bus. It was a very cool experience but it was dark, we had 1 small flashlight between 3 of us, it was raining, and we had to hike through slippery, uneven lava terrain. But clearly I lived to tell the tale. Oahu: Now this island is my home away from home. My father–who has been retired for over 20 years–likes to be in the midst of the ‘action’ in Hawaii, so we spend the majority of our time on this island. I often say that Waikiki is like New York City in paradise. NYC is my fave city in the world, so take that statement with the grain of salt. And because of my father and his aforementioned proclivity to want to do all things entertaining, we’ve explored. Pearl Harbor—I recommend a tour, that way you don’t have to deal with getting tickets and then you can lump in seeing the Mighty Mo and possibly Punchbowl Cemetery. I believe Roberts Stars and Stripes tour is the only one that goes to Punchbowl. Polynesian Cultural Center—I think this is consistently named the #1 tourist attraction on Oahu. It is a neat set up, seeing the different villages representing the Polynesian Islands. The canoe parade is beautiful so get a good spot ahead of time to take pictures. Paradise Cove Luau—The location is gorgeous, food yummy, and drinks delicious. It is somewhat similar to the luau at the Polynesian Cultural Center, but I would recommend Paradise Cove—after all, Kimora Lee Simmons enjoyed it. Navatek Dinner Cruise—Great views of Diamond Head at night and if you go on a Friday, they stay out an extra hour so you can see fireworks on the island from the ship. And the buffet is good. Snorkeling at Hanauma Bay—Personally, I hate snorkeling because I can’t breathe through my mouth and I hate stuff on my face, but even I did it. It’s very pretty and was definitely worth it. I think it’s closed on Tuesday’s, but double-check me on that one. 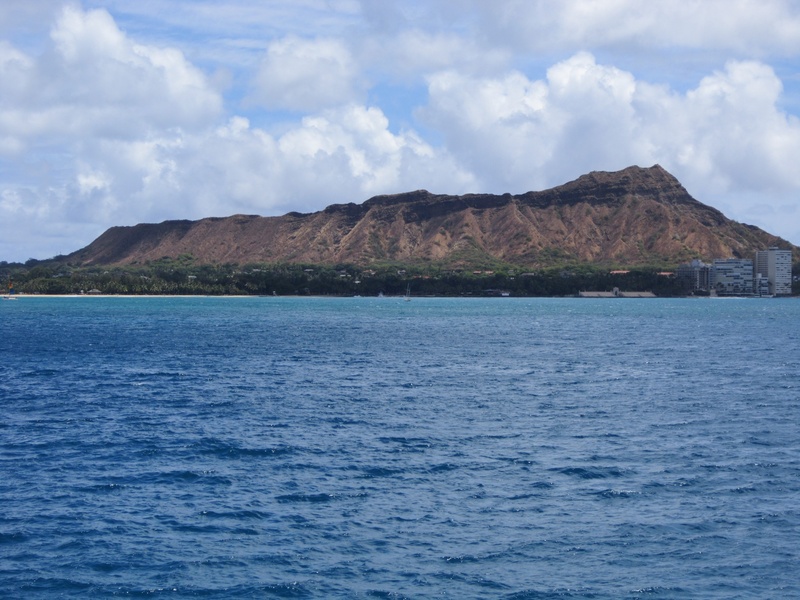 Climb Diamond Head—The views are gorgeous, but the climb is no joke. A lot of switchbacks, 100 steep steps at one point, an iron spiral staircase, and then an opening in a rock wall to climb through. But your pictures will be awesome. Iolani Palace—Very pretty and truly a place to go if you like history. The tours are given by volunteer docent’s and it’s downtown. If you take the trolley, you can hop off at the Aloha Tower and Marketplace and get some good pics at the top of the tower. Red or Blue Line Trolley Tours—If you have a down time kind of day. North Shore–Rent a car, see the surfers at Sunset Beach, eat at a shrimp truck, stop by Ted’s Bakery, and spend the day wandering. The Hula Grille is my favorite restaurant. The purple (taro) mashed potatoes and the oil for the bread are yummy. Duke’s is touristy, but you kind of have to go. The live music is pretty good and it’s on the beach. Plus, their breakfast buffet is AWESOME, so is their salad bar at dinner. Keoni’s for breakfast is a bit of a hidden gem. I love their pancakes and corned beef hash. Eggs n’ Things—But if you go to the original one on Saratoga Rd., you have to go when they open or at an off-peak time of day because it is just that crowded. Pai’s Deli—It’s in the Outrigger Waikiki. A literal cut out in the wall on the bottom level of the hotel, they have the freshest sandwiches and veggies ever and the iced tea keeps you going back for more. Any shaved ice stand will do, just have make sure you have one (or more). You could also visit the Byodo-In Temple, the Dole Plantation (ride the little train), the Aviation Museum, take a submarine ride (pretty cool), and see the Society of Seven show. Oahu will not leave you wanting for things to do, trust me. So when you get back from your visit, drop me a line and let me know what you thought!